Hello everyone! I had a very productive weekend and was finally able to do some house work, finish a couple of cards and edit another video. Woot woot! Anyhow, today I’d like to share 3 more project using the May 2015 Card Kit from Simon Says Stamp. You can see the three other cards I shared last week here. One of those cards includes a video tutorial which you can watch below or on my Youtube Channel. 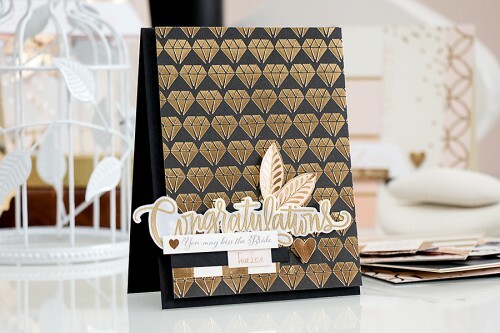 Its very simple, nothing special, just a basic card making tutorial using the contents of the kit only. 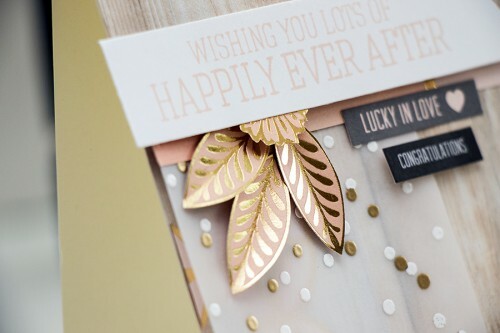 So here’s a look at this card – its yet another Wedding Happily Ever After Card. 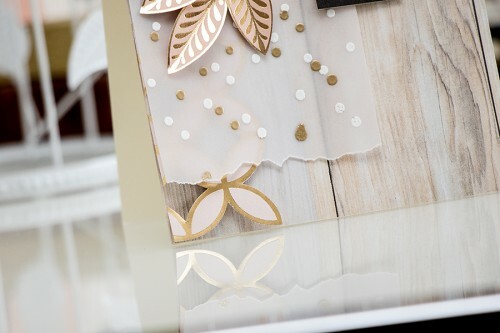 I started making this one by adhering wood grain patterned paper onto a cream A2 top folding card base. Next I stamped a beautiful sentiment using a stamp set from my kit and also the new Simon Says Stamp Pale Blush Pink ink. 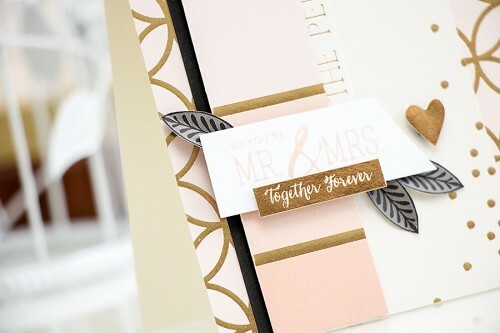 I also created a multi colored vellum piece by heat embossing the confetti border using white and than gold embossing powder. I fussy cut several leaves and a little flower from one of the sheets from the patterned paper from the kit and uses those to embellish my card. Like this video? Please give it a thumbs up! Thank you so much! Which card is your favorite? I’d love to know. Thanks! I like how you combine papers, I loved the card in the video and the one with all the left over papers. I wasn’t liking this kit as much until I saw your cards, now I’m exited to get it. Thanks for the inspiration. thank you, Irines! 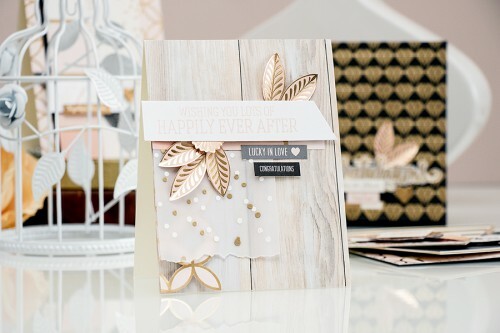 The kit is really gorgeous and the beauty of it is – after making 7 cards I still have lots of supplies to play with. thank you so very much Hazel! Big Hugs! 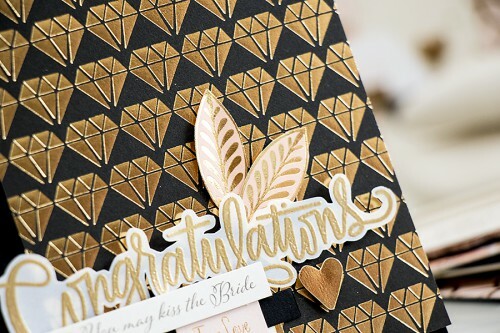 I really like the card with the gold diamonds on the black cardstock. Can’t wait to get my kit! thank you so much, Hope! I’m sure, your cards are goingto be stunning! Hugs! I really can’t say as they are all beautiful. It would be a toss up between the first and last ones??? Still can’t decide. Your cards are all lovely! The first one is my favorite. 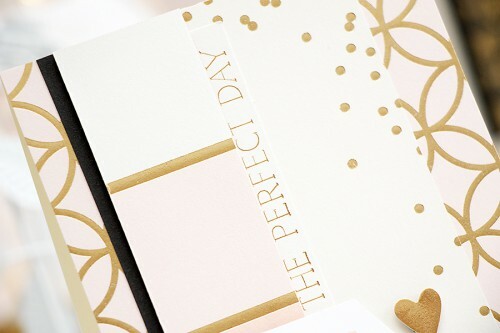 Love the way you embossed the gold and white dots. So clever! ха ха 🙂 “ой, она же черная” – це не про мене? 😀 дякую, Віка! 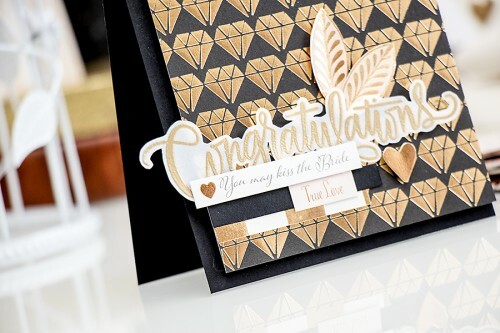 I like the black diamond with congrats the most. The double embossed vellum is super, but the black beauty took my breath away. my pleasure, Traci! So glad I was able to inspire 🙂 Hugs! your first card is my favorite.